Origin and Habitat: Vallegrande, Santa Cruz, Bolivia. Echinopsis ancistrophora var. densiseta grows just at east of var. vallegrandensis. Description: Echinopsis ancistrophora var. densiseta (a.k.a. Lobivia arachnacantha ssp densiseta) is a cold hardy species in the Cactus family (Cactaceae). This is one the several questionable varieties of the morphologically variable Echinopsis ancistrophora subs. arachnacantha (a.k.a. 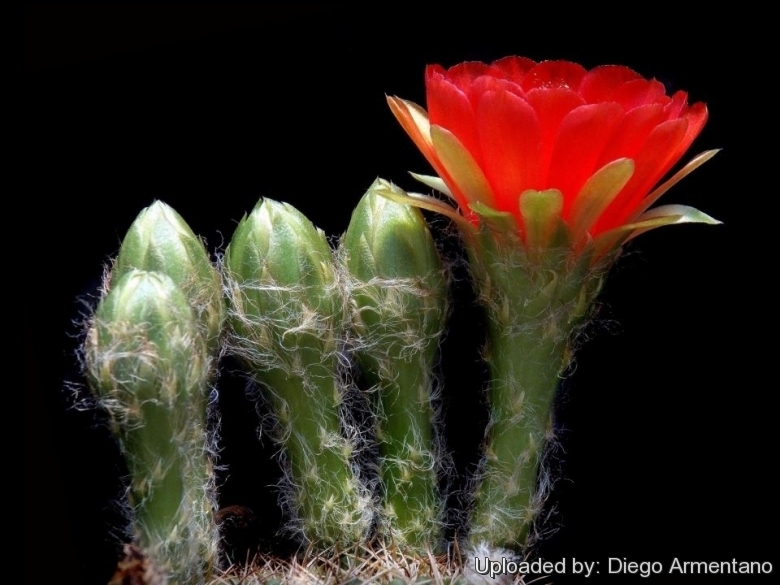 Lobivia arachnacantha), a taxon growing widespread in southern Bolivia and northern Argentina. The great variability of Echinopsis ancistrophora is due to the fact that cross pollination among different varieties (in habitat and especially in collections) is very frequent and it can be quite difficult to determine what is the "pure type" and the cross. The var. densiseta has longer spines than some of the others. And when the plant is hunkered down over winter the spines really are quite dense (hence the specific name). In the growing season they are more spread out, but if you compare the plant with var. torrecillasensis, for instance, then it really does have dense spines, however the colouring, size and density of spines is greatly influenced by the conditions of culture, at lower light levels the spines are less numerous, delicate and paler, while with strong solar radiation the spines are stronger with a darker tint. The var. densiseta has red blossoms, but sometime with a more pink or orange tint, while the var. arachnacantha has often yellow or orange flowers. Cultivation and Propagation: Echinopsis ancistrophora var. densiseta is a good beginner cactus and very easy to grow and flower. It is quite resistant and occasionally gets covered by bright showy yellow blossoms also neglected in a dry windowsill. Requires good drainage and very porous potting mix. Watering Needs Need regular water in spring to fall but do not water again until dry. Also, it is a species that is dormant in the winter and require very little water (maybe even none) during the cold months.